Are you searching about Air India Limited company jobs? they are hiring for freshers recently. now you can check it below. 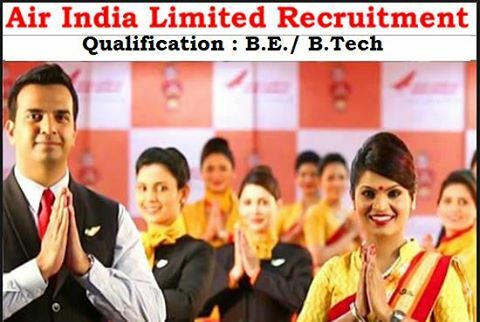 Air India Limited invites online application forms form all eligible and interested candidates for the recruitment to the posts of Graduate Engineer Trainee Posts. As per notification of Air India Limited 2016, Total no. of Graduate Engineer Trainee Posts is 102.The official notification of Air India Limited Recruitment 2016 has been uploaded and all details regarding these Graduate Engineer Trainee posts is given below. Salary range: Selected candidates will get the salary of Rs.25000/– per month. Date to applyLast date to send online application forms is 30th September, 2016. Last date to submit the printout of application form is 15th October 2016. Age Limit : Upper age limit is 28 years. There is a relaxation in age limit i.e. 5 years for SC/ST category and 3 years for OBC. Application fee for candidates belongs to General/OBC category is Rs.2000/- ; SC/ST/Ex-Servicemen category candidates have to pay no Application fee. Selection for these govt jobs of Graduate Engineer Trainee Posts will be made through Interview. Air India Limited department requires application forms through online mode only. Last date to send online application forms is 30th September, 2016. A) Apply online for Graduate Engineer Trainee positions by visiting Air India Limited official website. B) Read all instructions and fill the form with all your required details. Press on submit button. C) Closing date to send online application forms is 30th September, 2016. D) Then send the hard copy of the application form with all required documents on or before 15th October 2016.